It has been about 3 months off and on. 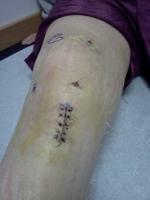 I did a lot of cardio and stabilization exercises for my knees, history of right broken femur when I was 17. My leg is shorter by about 1/2 inch. I am 53 now. I have seen two different GP'S. One said maybe arthritis and fluid; the other said fluid and just to keep working it. I can hit the treadmill for 30 minutes no problem. If I start using the climbing machine or even today walking round Costco for 20 minutes I start limping with pain in the hamstring area and back of the knee. If I rest it and take an anti-inflammatory it seems to be ok till the next episode?